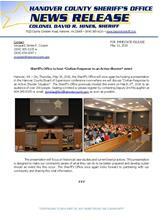 Hanover, VA - On Thursday, May 26, 2016, the Sheriff’s Office will once again be hosting a presentation in the Hanover County Board of Supervisors conference room where we will discuss “Civilian Response to an Active Shooter Situation”. The Sheriff’s Office previously hosted this event on March 3rd, 2016 to an audience of over 200 people. Seating is limited so please register by contacting Deputy Jim McLaughlin at 804-365-6335 or email: [email protected] as soon as possible.